Tourists of all demographics flock to the Algarve throughout the year to enjoy its many benefits. A growing trend to add to the beach-goers and golfing folk are those that seek activity-based holidays to take in the beauty a county or region has to offer via foot and bicycle. Headwater is one operator that offers breaks of different durations to many of Europe’s picturesque regions, allowing holidaymakers craving a differ buzz to the sun lounging type. The typical itinerary of an Algarve trip with Headwater would consist of arrival at Faro airport where you would be met by your contact from the operator and the trip begins. The first port of call, about a 90 minute transfer, is Amado Beach where the stunning rocky coastline brings high waves and keen surfers. This will be the discerning gent’s first real moment to take in a glimpse of the miles of rolling coastline as he enjoys lunch at Sitio do Forno, a seafood restaurant offering 180-degree vistas of the coastline in typically Portuguese style. The afternoon sets you on the way to the village of Pedralva, a once thriving village set in the valleys and surrounded by mountains. History here shows that Pedralva was whittled down to just nine inhabitants by 2006 when someone had the great idea of turning the entire village into a hotel – Aldeia da Pedralva. Now 24 houses have been restored into individual residence to suit individuals, groups or families. All traditional in look and feel, the setting amongst the cobbled village streets makes for a charming experience. The restaurant is excellent for traditional Portuguese meals, highly recommended. 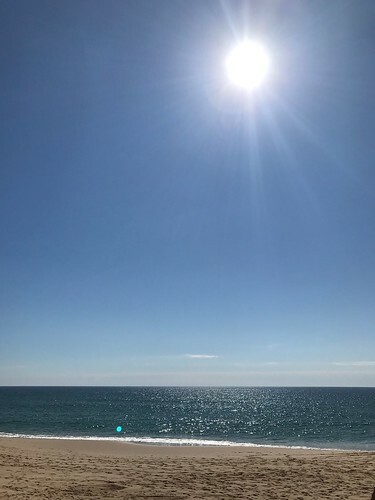 The first day is generally a day to settle in and adjust to the new surroundings – the sea, the land and the near cloudless blue skies. Dependent on your itinerary and duration, the physical exertion starts on day two when the walking part of the trip starts. Once transferred by coach to your starting point in Figuiera, the 15km walk along the coast starts once you get to the first beach – Praia do Zavial. Here you will hike up to the top of the coastal headland and trek across landscapes featuring a myriad of orange and green hues to your right and the pristine blue sea to your left. The walk will take you to Sagres but you do it at your own leisure or pace as these are generally unguided walks – though your given maps, reference points and an emergency number should your bearings fail you. The beauty of a trip taken in at your own leisurely pace – you can stop as many times as you like for photos (think of your Instagram game), drinks (keep hydrated) or simply to spend a few moments taking it all in. You have all day to get the 15km done. Whilst your luggage will be waiting for your at your destination. 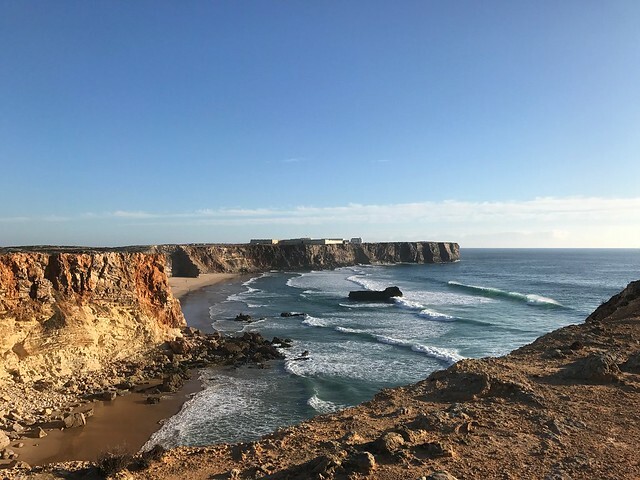 Once you reach Sagres, be sure to check out Cabo Sao Vicente – it’s the most South Westerly point of Portugal where the Atlantic Ocean meets the Mediterranean Sea. It is easy to witness the crashing waves of the former meet the calm nature of the latter seas at this intersection. 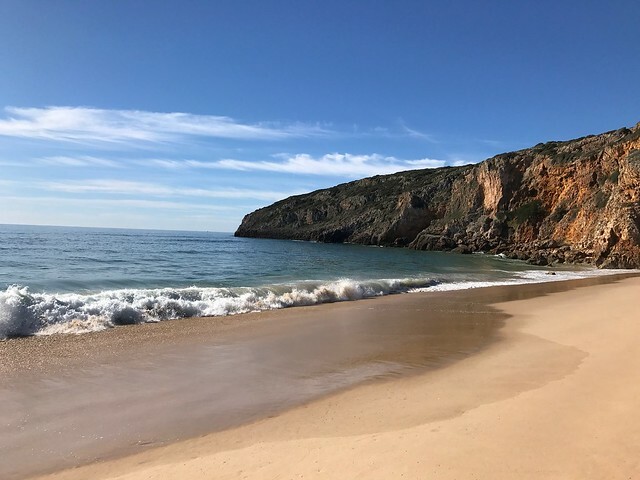 The stretch of Sagres beach is powdery soft white-yellow sands that leads you to your hotel for the night – the Memmo Baleeira – worked into the cliff above the bay. It is modern and features a fantastic restaurant with views over the sea and pool. After a night resting the legs and reflecting on the many panoramic vistas taken in by the eyes and mind, you will be ready for the 39km cycle from Sagres to Lagos. You will be given a modern road bike set to your height preferences, a saddlebag to hang over the rear wheel of the bike and installed RideMyGPS app for your smartphone to aid your navigation along the way. The ride itself is a mixture of flat roads, some uphill climbs and enjoyable downhill stretches as you roll from town to town along the coast. Again, it is at your own pace – so speed up or ease down. Stop once, twice, whatever you like for brunch, lunch or refreshments. One particularly nice spot for a seafood lunch is in Burgau with its long expansive sandy beach and temping sea. 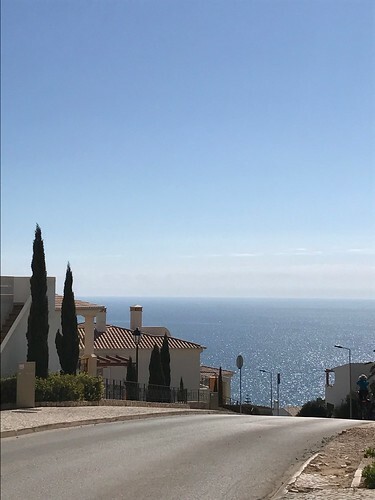 Once recharged and ready for the afternoon ride you will ride on through the tourist trap of Praia da Luz as you head towards your destination in Lagos. The hotel here is the boutique Costa d’Oiro on the outside of built-up Lagos and only a short walk from the sandy beach of Praia Dona Anna. Dependent on the duration and itinerary you choose with Headwater Holidays, you might have further stops across the coastline of the Algarve before you are heading back home via Faro airport. 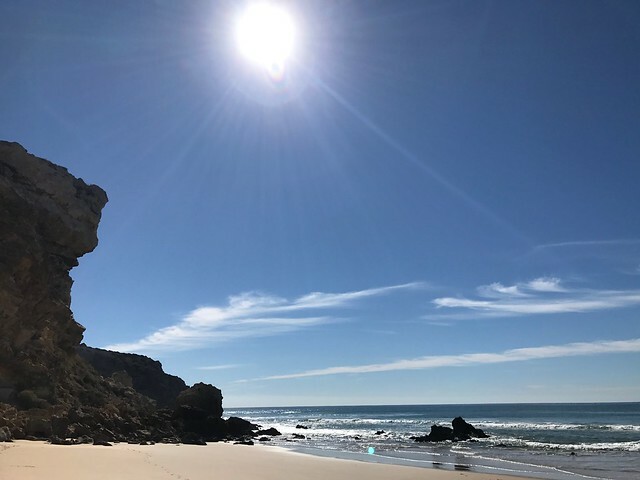 Given the physical nature of this kind of holiday and soaring summer temperatures from June through to August, Headwater operates Algarve trips from March to May and September to October. If the discerning gent is looking for a different way to experience the wonders of the Algarve, this is certainly a way Elysium Magazine would recommend. Headwater also operates similar trips in the South of France and across Italy’s wine region.